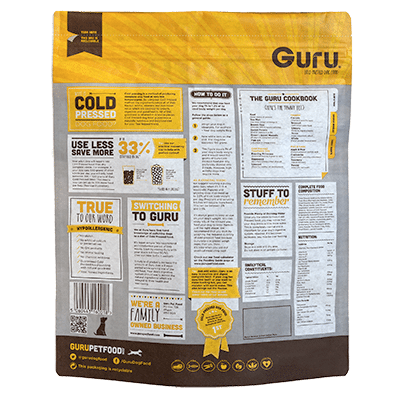 We believe that your four legged friend deserves natural food full of natural ingredients. Help your dog enjoy a healthy mealtime every day with our delicious Surf & Turf cold pressed dog food. The delicious flavours of beef, sea fish and vegetable are retained during the cooking process, along with all the natural and nutritious goodness! We select every ingredient carefully before mixing them together at low temperatures. This special cold pressed method makes a meal your dog will enjoy. 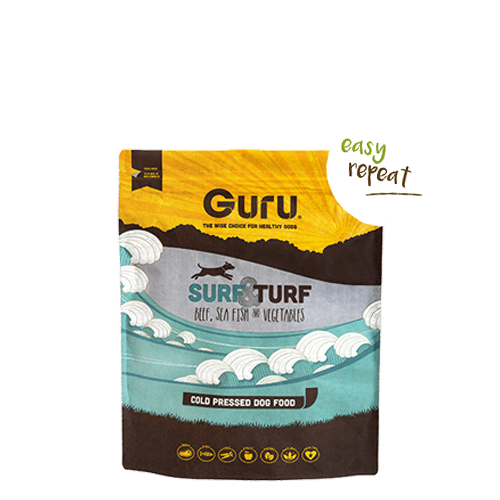 Why not try our Surf & Turf in a bigger bag to keep your dog happier for longer? Dried Ground Beef (30%), Brown Whole Grain Rice (thermally pre-treated), (29%), Dried Ground Sea Fish (7%), Sweet Potato (7%), Dried Poultry Liver, Maize Germs, Mixed Vegetables (alfalfa, broccoli, carrots and chicory), Mixture of Cold Pressed Vegetable Oils (evening primrose, linseed & rapeseed), Seaweed (dried), Beet Pulp, Fish Oil (4%), Gelatine Powder, Dried Moor, Dried Fruits (apples, cranberries, pears), Dried Herbs (green tea, parsley & rosemary) Yucca Schidigera (dried), Garlic Powder, Pre Biotic (FOS, MOS), Dried Green Lipped Mussels.